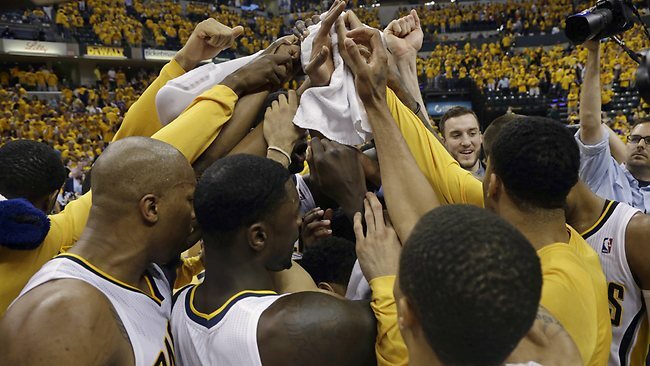 The Indiana Pacers are going to win the Eastern Conference. There are so many factors pointing us all towards that belief, yet so many of us are still refusing to buy-in. Maybe it’s the LeBron factor. That’s a big one, for sure. As Rudy Tomjanovich taught us, ‘don’t ever underestimate the heart of a champion’. Maybe it’s also because they’re the Pacers – a franchise that is so often the bridesmaid but never really the bride (having never won an NBA title and having appeared only once in the NBA Finals). Nonetheless, here are 5 key reasons why we should put our doubts aside and start believing in this Pacers squad. 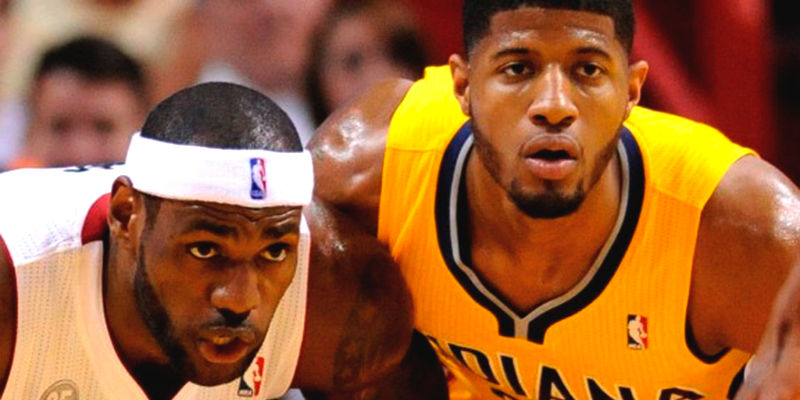 The Pacers lost to the Miami Heat in the Eastern Conference Finals last year… in 7 games. The Pacers worked their asses off all year and then went toe to toe with the defending champs all the way to the wire, only to be painfully defeated. That’s a sting that will stay with you a while. I have felt that kind of pain before. I was once a member of a Melbourne Tigers team that battled with the South Dragons through a 5 game Grand Final series. That final result did not go our way either and I can tell you that to this day that loss still haunts me. The desire to atone for last year’s defeat is undoubtedly fueling the drive and determination that this Indiana squad has been playing with throughout this NBA season so far. Young teams are often not ready for the BIG stage of the NBA Conference Finals and NBA Finals. All NBA players concede that it’s a different level of hype, coverage and critique that goes on once you get that deep into the season, not to mention pressure. Some teams thrive on it, others are simply not ready. Take the Miami Heat in 2011 when the big three was first put together. They had all the talent – after all, that same core talent has won them back-to-back titles. However they came up against a team of veterans who knew how to handle the ‘BIG SHOW’ that is the NBA finals. My point is it often takes a team getting to the summit and failing to realize what it takes to finally conquer it. This Indiana team has tasted defeat and they are now ready to conquer their rivals. The man is only 23 years old. He was last years MIP and is currently in the MVP race for this current season. I speak of course, of Paul George. Watching the development of George has been nothing short of amazing. He has been thrust very quickly into the role of leader for this squad and has played a huge role in turning the entire direction of the Pacers franchise around. George is a big reason why the Pacers will win the East this year. Last season the Pacers dropped many tight games down the stretch. With Paul George playing with a new level of confidence and belief in his own ability, those close losses will now turn into close wins. George has developed, what I like to call, the Franchise attitude. He knows that when it heads down the stretch of a close game, he needs to have the ball and be the one who is making the play. Earlier this week against Portland, George made huge play after huge play, keeping Indiana in the game. The Pacers didn’t get that particular result, but more often than not this season those tight games are going to fall the Pacers way and George will be the reason why. Indiana’s depth and their understanding of roles is the best in the Eastern Conference. I would have said ‘best in the league’ but I think San Antonio takes the cake in this department, but the margin is getting smaller. The Pacers ownership and management under Larry Bird and Kevin Pritchard have done a great job of putting together a squad that addresses their shortcomings from a year ago. Head Coach Frank Vogel, Paul George and the other leaders on the floor have taken that a step further and done an amazing job of defining each individual’s role on this team. Every Pacer seems to be on the same page. Not only does each individual know their role, but they each seem content, and even desperate, to fulfill it. Lance Stephenson has assumed the position as resident hustle guy and by doing so has become one of the leagues best ‘whatever it takes’ players. The team is not rebounding well and suddenly Lance grabs the next handful of boards. The team is struggling to score and Lance quickly produces some high-percentage points. Stephenson is always looking for ways to spark the team, all the while maintaining his ability to be a lock-down perimeter defender. Before he moved to Indiana, David West was a two-time All Star whilst playing for the New Orleans Hornets (now Pelicans). And on a crappier roster he still could be. Great teams need players like David West. Superstars who are willing to play a role and step up when required. Superstars who are willing to sacrifice their own stardom for the team’s success. West’s contributions often go un-noticed. His off-court veteran leadership in the locker room has fostered an environment that has allowed George and Hibbert to emerge as on-court leaders. On the court, West’s interior toughness on both ends of the floor keeps his team-mates confident and his ability to draw defenders from the basket with his deadly 17 foot range is a key component of the Indiana offense. It opens up the lane and provides scoring opportunities for slashes and penetration from the likes of George, Stephenson and George Hill. Most importantly, the offensive game of the 17-Foot Assassin (as Chris Paul labelled West back in 2008) fits perfectly alongside big Roy Hibbert’s old-fashioned low-post game. Each player on this squad plays a crucial role to the team’s success. I would love to go through them one by one but we would be here all day so I will limit it to just these last two; the offseason addition of Luis Scola and the unselfish play of George Hill. The Luis Scola addition did not get nearly as much attention as it should have and the Pacers organization should be wrapped with their efforts in obtaining him. Scola is a proven scorer in the league and one of the league’s best at drawing charges on big men. He moves his feet better than most bigs and is usually able to establish excellent defensive position, often causing turnovers. Having such a proven high quality player coming off the bench is a luxury the Pacers simply did not have last season. George Hill has developed into possibly the most unselfish point guard in the NBA. In a league where so many teams base their offensive structures around point guard isolations and one on one play, Hill has sacrificed his game in order to get the ball into the hands of the Pacers’ biggest weapons (George, Hibbert and West). Next time you watch Indiana play, watch the way in which Hill gets the Pacers into their offense. Most NBA points guards run the show by penetrating and finding shooters as that gets them dimes and scoring opportunities. Hill stays reliably within Vogel’s system and, more often than not, delivers the pass before the pass that gets the assist (the hockey assist!). This kind of play doesn’t sell jerseys. However anyone who has played the game at a decent level can appreciate this type of contribution. 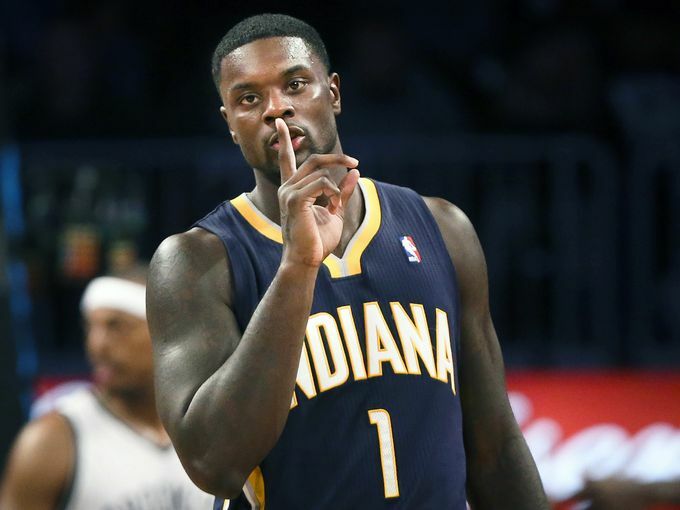 Certainly Hill’s Pacers teammates cannot speak highly enough about his play. Now I can already hear everyone screaming “every team is a team, you idiot! How does that separate them from Miami?” When a team is highly dependent on two/three main guys it becomes very hard for the team to develop a mutual respect amongst the entire group of players. Although Miami is a “team” and they play well together, their ability to reach that higher level of togetherness is diminished by that simple fact. The Pacers, on the other hand, led by George, Hibbert, West and Hill, do not have this concern. They have all bought in to the team dynamic and are playing for each other. They went through the tough times last season and they now understand that it will take all of them playing their role to get them those few steps further. Immediately after their play-off exit last season, when asked about his impending free agency, David West replied: “I’m not (expletive) dumb. I don’t plan on going anywhere. This is my team. These are my guys.” That set the tone for this group to move forward together. Lets just say maybe they don’t seem quite as focused. Hibbert was a nightmare for the Heat to guard in last years playoffs where he averaged over 20 and 10 for the series. Miami made a desperate move during the offseason in obtaining Greg Oden along with plenty of extra medical staff in a Hail Mary attempt to find someone big enough to stop Hibbert. This may well prove to be yet another chapter in the Pat Riley legacy! However I severely doubt it. Even if (and it’s a huge ‘if’) Oden is able to take the court during the playoffs, he will have not played at the NBA level in years and will be coming up against a bulked up, in-form Roy Hibbert. Other than Oden the Heat simply have no answer for Big Roy. The closet guys they have are Chris Andersen at 6’10 228 or Chris Bosh at 6’11 235. Both of those options are giving away at least 3 inches and 60 pounds. In fact, Bosh got to the point during last season’s playoffs where he refused to answer questions about Hibbert due Roy’s dominance over him. Whilst the Heat have no answer for Roy’s powerful low-post offensive game, Hibbert will also continue to cause all sorts of headaches down the other end. Not many teams in the league have someone with the size and shot blocking/changing ability of Roy Hibbert. He will not be able to single-handedly stop Wade and LeBron slashing for easy baskets, but he will at least be making life very tough for them at the rim. The Indiana Pacers are well constructed and very well coached under Frank Vogel, who has established himself as one of the smartest young coaches in the league. As a group, they’re motivated and they know what it’s going to take to win the East. I believe the time for doubting this Pacers squad has passed.